Parts list: N°1 hexagonal tower with wooden posts section. 9x9 cm and roof flaps in six bi-laminate HPL. Size Ø 225 x 435 h equipped with a platform in birch plywood glued with phenol, with knurled non-slip, assembled to the uprights using galvanized steel frames. The tower is equipped with protection panels on mahogany plywood to okoumé phenolic adhesive-free edges and grooved treated with impregnation colored non-toxic paint and finished with wax-based water-soluble. N°1 perch in round tube Ø 25 mm galvanized steel oven 180° C. N°1 climbing ladder with protective panels which act as a handrail made ​​of mahogany plywood okoumé grooved phenolic-glued and no edges. Treatment with potting colored non-toxic paint and finished with wax-based water-soluble. N°1 tunnel slide h. 150 cm of polyethylene. 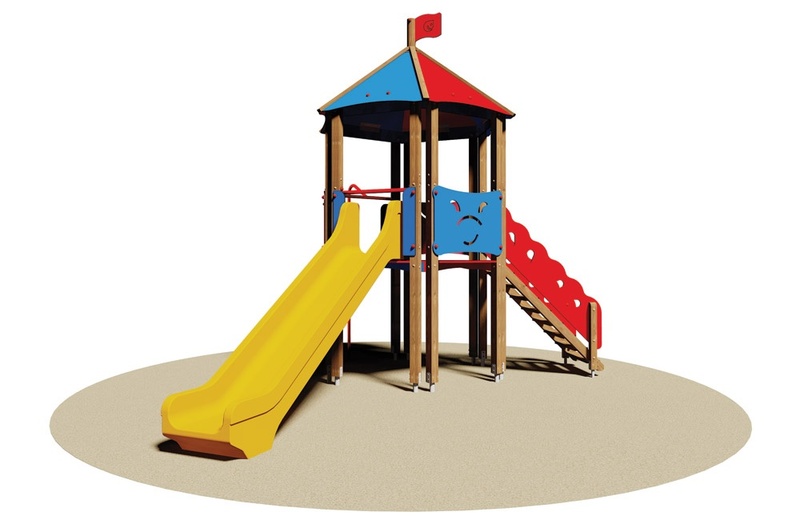 As an alternative to a tunnel slide can be mounted in a slide track with a polyethylene or stainless steel and bent plywood mahogany sides okoumé with phenolic adhesive. Assembled by 8.8 galvanized steel bolts and nuts. Elements covernut under colored nylon. Attacks in galvanized metal, for anchoring to the ground.